The Theravada Pitaka composed of the Sutra Pitaka, the Vinaya Pitaka and the Abhidhamma Pitaka of third Dhamma Sangayana was inherited to the island as a heritage at the 3rd century B.C. and the Buddhism that was inherited and nourished throughout centuries with the fullest patronage of the state. 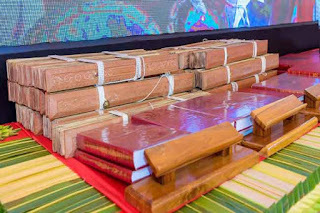 The Mahasangha including the Maharahath Theros preserved and secured the Tripitaka through the centuries amidst such challenges was declared in written form in thalapath (Ola leaves) in the 1st century B.C at Matale Aluvihara temple. After that momentous moment in the year 1956 when Tripitaka was printed as a complete volume, this is marked as the most historical moment. The Tripitaka had a greater impact on the society, enhancing discipline and wisdom. The Pali Tripitaka is a representation of pure Buddhism according to the researches that were conducted.